On Sunday (04 February 2018) Our Lady of Assumption Parish youth handed over the Symbols of the Pilgrimage of the Cross to St Joseph’s Parish youth. This was after a night vigil held at Salesian Community Chapel by OLOA young people to bid farewell to the Cross on Saturday (03 February 2018). 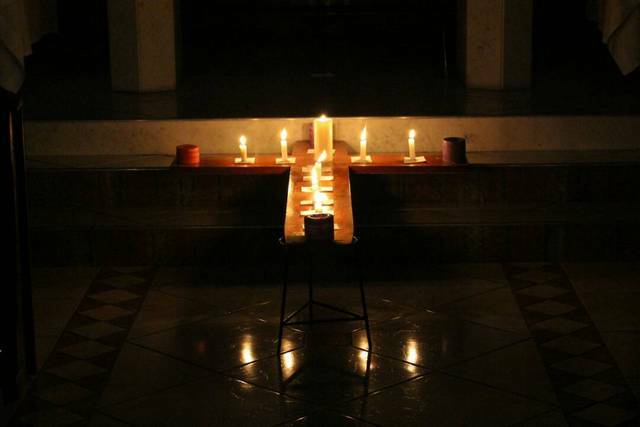 During the night vigil young people from OLOA learnt the true meaning of the Cross within their Catholic Faith that, “it is the truth that Jesus Christ is Lord and our Salvation” (Fr. Joseph Nguyen SDB) and what it means wearing the Cross which is commonly seen among our Priests. The revelation came after a video clip which young people watched about the Cruxification of Jesus Christ and His rise from the dead. Young people also had the opportunity to pray Taize prayer led by Fr. Joseph SDB, where they adored and venerated before the Cross and brought their prayer intentions for 2018 before Christ. 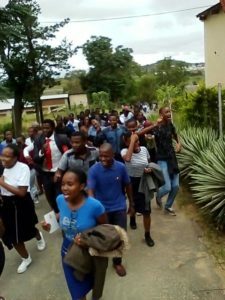 In the morning on Sunday (04 February 2018) OLOA together with St Josephs youth and patrons, were joined by Student Priests from the Order of the Servites of Mary Community and Sr. Ngwenya OSM to welcome the Cross. 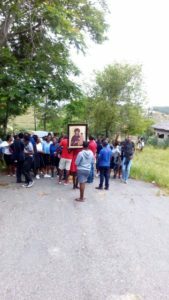 Young people on the “chain movement of the cross” (Dabulamanzi Ntshangase) which started last year at Santissima Annuziata Parish and has been to OLOA parish for the last three months until it was handed over to St Joseph’s Parish Youth last Sunday. The event took place from 8:30am at Makhokhondeni junction next to Mzimpofu electricity sub-station through to St Joseph’s mission. It started with a procession from the main road. 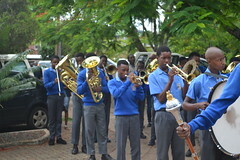 OLOA youth were the ones leading carrying the Symbols, the Cross, Icon of Mary, and the Candle, where they recited the glorious mysteries of the Holy Rosary. In a jovial mood, after the prayer young people sang till St Joseph’s mission where they were warmly welcomed by the Parish Priest Fr. Wandile Dlamini OSM. He touched young people by kissing the Cross in a sign of welcome and that gave the young people the knowledge of the importance of the Cross. In the reflections of the Word, Fr. Wandile shared to the faithful that no matter the hardships of life but as Christians we shouldn’t lose the faith in our Lord. We should believe that, someday they will come a time where He is going to wipe all our tears. This he explained in an example of the story of Job who never lost faith in God even when all hope was lost. He mentioned that, no matter how hard life can be but we should always remember that Jesus Christ never neglected us on the cross but died innocently for our sins. At the end of the Eucharist prayer he lit the candle and proclaimed that Jesus Christ came to be Light of the world and that it is our duty as Christians to share God’s light with others through the sharing of the Word. In conclusion, OLOA chairperson Thamsanqa Shongwe explained the significance of each of the Symbols, the Cross as the truth that Jesus Christ is indeed Lord and our Salvation, the Icon as being the support of our Holy Mother, Blessed Virgin Mary to intercede for us to her Son, and the Candle as a symbol of Jesus Christ being the Light of the World. 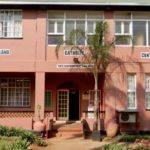 His Vice, Mkhatshwa Nomphumelelo also being the Diocesan Youth Executive Media & Communications Officer added that, the idea was taken from that initiated by Pope John Paul II in 1985, which is celebrated internationally every three years at different locations. The next coming celebration will be held in Panama, Central America, next year 2019. On behalf of the DYEC, she also explained that, young people are expected to venerate and adore the Cross in any way they want with the help of their priests, that is there is no direct programme. It was also mentioned that, the next coming parish will be Good Shepherd and the Cross will end at Our Lady of Sorrows (Hluthi).